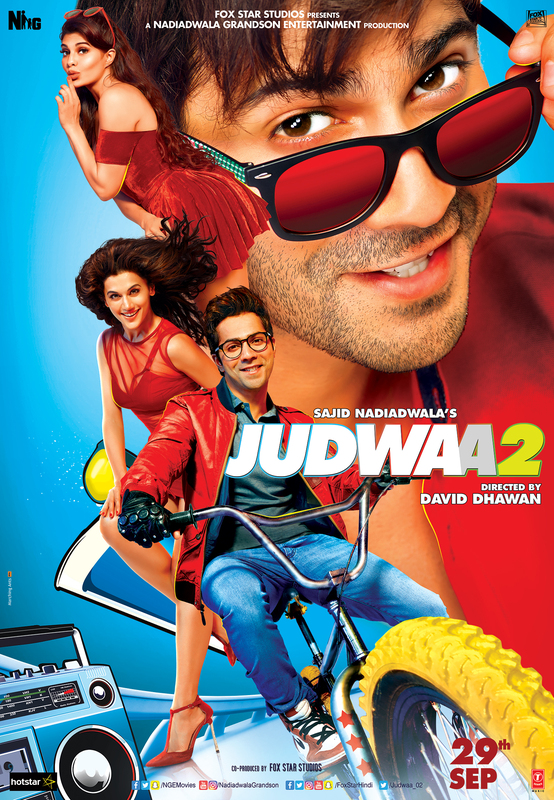 Brace yourself for an explosion of laughter, mayhem and entertainment, as the deadly trio of Varun Dhawan, Jacqueline Fernandez and Taapsee Pannu join hands with comedy king director David Dhawan to bring rib-tickling fun this Dussehra, with Judwaa 2, releasing on the 29th of September. Presented by Fox Star Studios and produced by Sajid Nadiadwala’s Nadiadwala Grandson Entertainment, the comic caper “Judwaa 2” sees Varun Dhawan in a double role, replicating the iconic Jodi of Raja and Prem, 20 years since Salman Khan’s yesteryear 1997 hit Judwaa. The film is also stars comedy stalwarts Anupam Kher and Rajpal Yadav. The plotline of the film, being directed by the master of comedies, David Dhawan, promises ‘Double The Fun, Double The Entertainment’. The laugh riot is set in Mumbai and in London tells the story of two brothers (twins) born to a honest businessman are separated at birth when their father exposes a smuggling racket and a king pin. One of the brothers is thought to be dead but only resurfaces stronger after living life on the streets to reunite with his family over a sequence of events and twist of fate. Genetically bound by reflexes both the brother’s lives interlink in strange ways and a comedy of errors. They eventually come together to destroy the smuggling nexus and save their family from a downfall that awaits them. Something cool is that megastar Salman Khan – the original Judwaa – will also be seen in the film sharing screen space with Varun Dhawan in a special cameo. We certainly can’t wait until Judwaa 2 releases internationally on 29th September 2017 through Fox Star Studios India. 16 queries in 0.677 seconds.